I am so excited to share this recipe with you today because it is a true family favorite. My mom has been making this recipe for years and my siblings and I especially request it in the summer. This time, I made the recipe using FarmRich Smokehouse dry rub smoked pork. This product is precooked and comes frozen without sauce so that you can use your favorite sauce or a homemade sauce. This recipe is an awesome mix of tangy, sweet, crunchy, etc. We usually serve the pork and coleslaw on wraps but they are also great on buns. This meal can be eaten any time of year but would be great now for football season or for a Halloween party. 2. Meanwhile, combine all ingredients for pulled pork and mix well. 3. Once pork is heated, combine with sauce mixture and stir well. 4. For coleslaw, combine all ingredients and mix well. 5. Take a bun or wrap and fill with pulled pork and coleslaw mixture. I was very happy with how these turned out! I have never made this recipe before as my mom is always the one to make it. It was delicious! 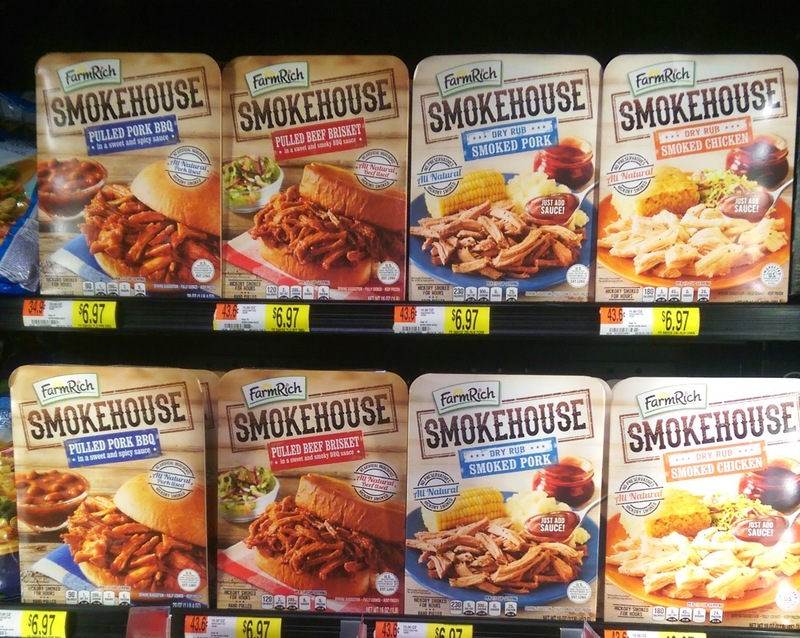 You can pickup FarmRich Smokehouse products now exclusively at Walmart. Walmart recently had a sampling event where you can taste these new products. I enjoyed trying the new products and think that they could be great for easy meals. I had already tried the Pulled Pork BBQ which was very good. I served it to my mom and grandma on a sandwich for lunch and we all enjoyed it. As a new mom, I do not have a lot of time to spend cooking in the kitchen and these products are great for quick meals. To save money on these products, print out this coupon. oh my! This looks good!! These look so tasty. Now I want BBQ!! Oh wow! These look absolutely incredible! I'm going to have to try this! Your BBQ sandwiches look delish, especially with the addition of the lemon coleslaw. I bet the flavor combination is awesome! We love anything bbq here - And I love the combination of flavors. Thank you! Oh wow. Everything Looks so good! Great presentation! This looks delicious. Love the flavors you've paired here. That flavor combo looks amazing! My husband loves coleslaw, but I don't think we've ever tried a lemon version. Sounds like it would pair really well with that BBQ pulled pork sandwich!